In September 1997, performance tests were conducted on Unit 1 at Fort Patrick Henry Plant. Flow measurements were made using current meters operated by the Norris Engineering Laboratory for comparison with the ASFM results. Both sets of measuring equipment were mounted on a moving frame which was installed in the intake gate slot and which traversed the flow from top to bottom. Comparison of flow rate results showed agreement between the two methods to be within 1%, demonstrating that the ASFM has the accuracy required to measure turbine discharge under operational conditions. 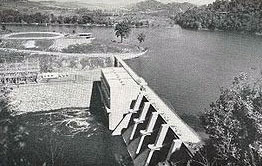 In 1999, TVA performed comparison discharge testing, using the traditional array of current meters and the ASFM, for two separate turbine settings. Upstream obstructions (horizontal beams supporting the trash-racks) resulted in a high level of turbulence, and the results from the two measurement methods differed by between 7% and 8%. It is unclear which technology was more accurate.